CBT) is an effective combination of talk therapy and behavioral therapy where individuals work with a therapist to find the source of negative thinking and transform those thoughts into a positive, growth mindset. The ultimate goal of CBT is to replace negative thoughts and actions with productive behaviors that make the individual feel equipped to overcome any difficult moment. This interactive training will include videos, role plays, direct instruction, and community resources. This course is designed for individuals working towards licensure of MFT, LCSW, LPCC. Lisa Colliss is a Licensed Clinical Social Worker and the Clinical Supervision & Training Manager at Community Solutions. 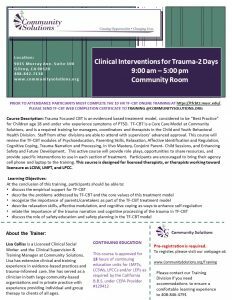 Lisa has clinical and training experience in a variety of evidence-based practices and trauma-informed care, including TF-CBT, Seeking Safety, Mindfulness, and the use of movement and yoga in trauma work. She has served as a clinician in large community-based organizations, an inpatient psychiatric hospital and in private practice with experience providing individual and group therapy to clients of all ages.